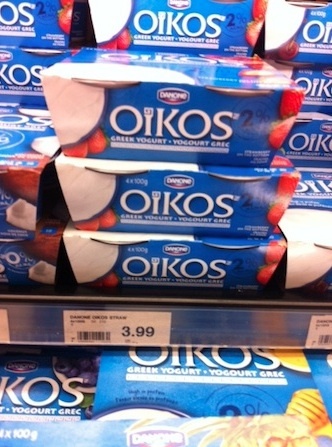 On Checkout 51’s list this week (Sept 19-25, 2013) is Oikos yogurt, 400 g or more. Dannon® Oikos® is fat free Greek yogurt as it should be—possibly the best Greek yogurt in the world. It’s rich, creamy-thick, and bursting with real fruit, and it has 0% fat. Reward yourself with Dannon Oikos. You will get $1.00 cash back rebate at Checkout 51. Here’s a pic of what it looks like. I found a couple prices of it at a few stores. You can use other coupons when you use Checkout 51. Checkout51 offer expires midnight Wednesday Sept 25, 2013. You must purchase in Canada and upload your receipt between midnight Thurs Sept 19-25, 2013 to qualify for the cash back rebate. Check out here for more Checkout 51 cash rebates for this week. Checkout 51 is a free app and available for iPhone from Apple AppStore and Android devices in Google Play. Visit Checkout51.com for their terms and conditions. Thanks. Feel free to add a comment on where you found yours and prices.